A self catering rental with easy access to beach and golf in romantic Algarve. SUMMER SPECIALS AVAILABLE NOW ! Our luxury penthouse apartment offers year round holiday rentals in the sun on a self-catering basis. Choose to soak up the sun on our huge roof-top solarium or play a game of golf at local courses, your time in the sun will be most enjoyable. We have furnished our apartment to a luxury standard and there is enough room to sleep 6. The local golden sandy beach will appeal to families and for golfers no fewer than 15 top courses are within an easy drive. For those wanting to experience the culture that the Algarve has to offer but wish to be away from the crowds of the western areas of the Algarve, our location at Cabanas is perfect. The nearby town of Tavira boasts many shops and many inexpensive top class restaurants to cater for families or that long romantic meal for couples. The hot summer months and mild winters offer you a year round rental opportunity to good to miss. Nearby areas of interest - TAVIRA: The town has since been rebuilt with many fine 18th Century buildings along with its 37 churches - in fact it is referred to as the town of churches! The town church of Misericórdia dates back to 1541 and Palácio de Galeria is a location of historical interest besides being a cultural centre. A Roman bridge links the two parts of the town across the River Gilão. The church of Santa Maria do Castelo is built on the site of a Mosque and in it are the tombs of Dom Paio Peres Correia and his seven faithful Knights.. The areas around are still rural and have not been spoilt by over development. The immediate beach for this town lies past the salt pans and is reached by a ferryboat. 360’ Roof top private solarium, with views to the ocean. Great for sunbathing and outdoor dining. 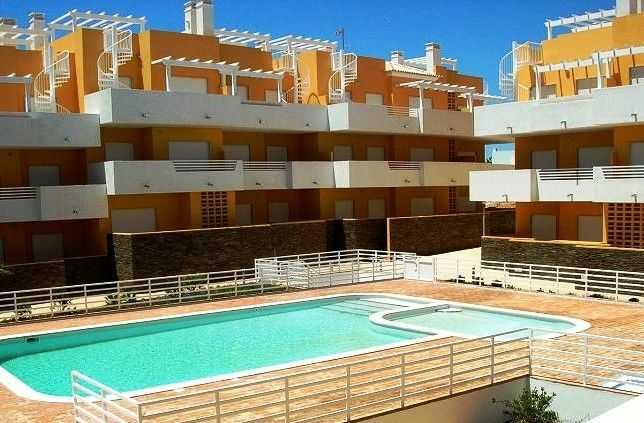 Due to the apartments close proximity to both the beach and golf facilities it is suitable for rental by families, couples or groups of golfing buddies. Remember the cost per week is for the unit and as it sleeps up to 6 people, the cost per head is significantly less than a hotel based stay. The children's pool and the communal pool offer a safe bathing environment and enjoy a sunny aspect all day. The apartment has both hot and cold air-conditioning, which caters for all seasons, and the lounge boasts a 32' LCD TV and DVD player, together with a luxury leather sofa and sofa bed. The views from the large penthouse rooftop terrace are to die for. Great place to relax and enjoy your holiday in Portugal. There are plenty of bars, cafes and restaurants within a very short walk of the apartment and you can also walk to the beautiful sandy beach of cabanas. We will be back again. Located in the nice district, close to the national road and 2 min by car to the beach. To walk is a little bit far. Very pleasant roof terrace just misses griller. The kitchen is well-equipped (but misses coffee-machine and dishwasher is not really cleaning well). The swimming pool is very pleasant, enjoyed it a lot. We had a fantastic holiday and the apartment was perfect. Many thanks for your feedback and very positive review Anna. We are glad and happy that you enjoyed your stay at Copa Cabanas. Just returned from 5 weeks in Conceicao. We have had a wonderful time, 3 weeks just the two of us and the last 10 days with friends. The apartment really was a home away from home. Equipped to a high standard and in a great location for exploring the eastern Algarve with or without a car. Will definitely be visiting again! Thanks for your review Lyn and so glad that you all had a great Christmas break In Cabanas. We look forward to welcoming you back to Copa Cabanas again soon. Chill out or go and explore, the choice is yours. A well maintained property with all the necessary facilities to make it a home from home. It's location is a 5 minute stroll to the local supermarket, which supplies all the essentials you are likely to need and more. The nearest golf course (Benamor) is on the opposite side of the road from the supermarket. The waterfront of Cabanas is a 15-20 minute walk, where restaurants. shops and two further SPAR supermarkets are located. Here you can take a ferry for 1.50 euros to the sandy beaches of the Ria Formosa. The local bus stop will take you to Tavira whilst the train station will take you from Faro to Monte Gordo and beyond. Both are a cheap way of getting out and about. Therefore, you can lay back and relax or you have the opportunity to further explore the Eastern Algarve. This is our second visit to this complex, so it goes without saying, we would recommend it to anyone. Kitchen well equiped for 4 people. Good beds and showers. Verry good roof top terasse with a sea view. Pool area is OK and not crowded. Tv with only a few UK channels. The property has some signs of use and the aircon was difficult to set. Unfortunately there was a smell when entering, which did not dissapear even after extensive ventilation. The our oppinion the appartment is too far from the beach to walk, parking is easy in the area. Cabanas resides on the doorstep to the Ria Formosa nature reserve and this offers a rural and peaceful backdrop. Beautiful wide golden sandy beaches ideal for families are abound and offer safe bathing. Along the Cabanas beach promenade, you will find a selection of shops bars and restaurants to choose from. If Golf is your passion, you are spoilt with an array of top class golf courses, the nearest being a short five minute walk from the apartment and a further two golf courses less than a 5 minute drive away. Further shopping facilities are available in Tavira, a short 5 minute drive away or catch the train to Tavira from the nearby Cabanas train station. You can even continue on the train journey to Faro and enjoy a day of designer Shopping at the very popular Faro shopping mall, which contains many shops and restaurants together with a multiplex cinema. Golf: The Algarve … a mere two or three hours flight from most European capitals and because of its unique conditions for tourism, its diversified quality and the geographical concentration of its courses, it makes the Algarve region one of Europe’s main, sought after, top class golf destinations. In fact the Algarve was voted Best Golfing destination in the World last year. The Algarve golf courses are equipped with all facilities that are needed for playing golf, making the sport one of the region’s highlights. None of the existing golf courses is more than 15 km from the coast. The Algarve's mild climate and low humidity are the delight of golfers from all over the world, who come to play golf on the Algarve golf courses all year round. SPECIAL OFFERS AVAILABLE FROM TIME TO TIME ONLY APPLY TO STAYS OF 7 NIGHTS OR MORE.